What's new: Minutes. Life Members. Kristen elected president: see new Board. Amended Bylaws. Party photos. MISSION: "The mission of the Burlington Library Association, Incorporated, "Friends of the Burlington Public Library," is to support the Burlington Public Library's services and programs by advocating public support and use of the library, and by generating assistance and revenue through volunteer involvement." (Read the Bylaws, the Articles of Incorporation and click here to view our IRS tax forms.) How do we put these formal words into action? Check us out on this website! The BLA Board differs from the Town Library Board. Have you joined our email list? If not, please click here to send your name and email address. Amazon will donate .5% of the price of your eligible purchases to BLA: please click here before you place an order. 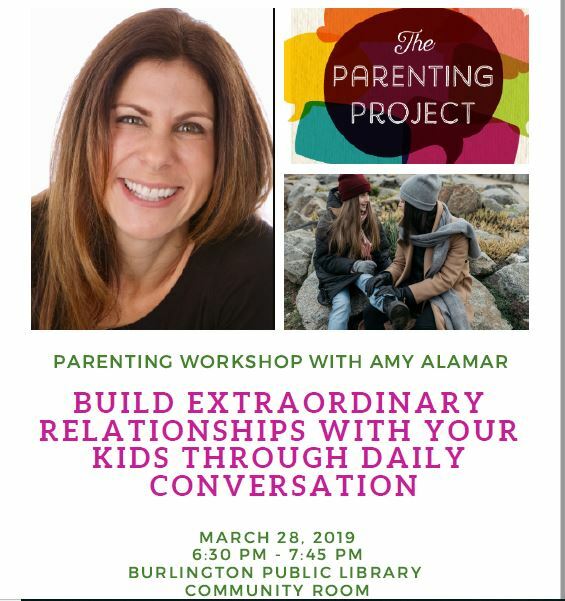 The Burlington Library Association is sponsoring a wonderful opportunity for parents and grandparents to attend a parenting workshop with local author and educator, Dr. Amy Alamar. Raising healthy children with an ability to sustain meaningful relationships is a challenge even in the most ideal situations. Add on hormones, attitude, personality, and technology - welcome to the tween and teen years! The Farmington Valley's own Dr. Amy Alamar, author of The Parenting Project: Build Extraordinary Relationships with Your Kids through Daily Conversation, will lead this interactive workshop, which will include a discussion about parenting the independent, emerging adult while nurturing the playful child within. There will also be a Q&A at the end. There is no cost for you to attend; however, registration is required. 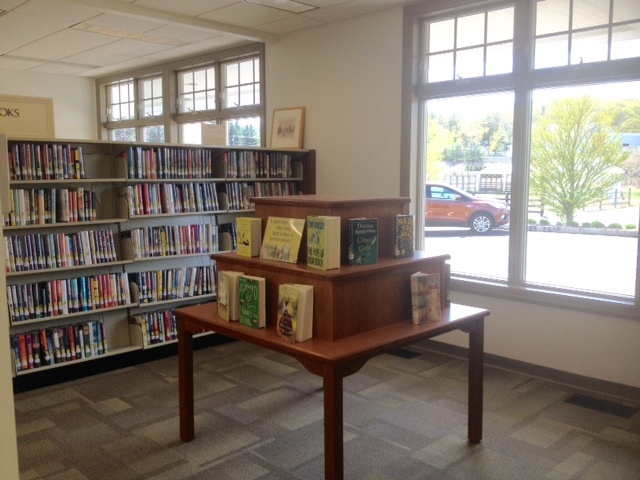 Please click here to visit the Burlington Public Library today! 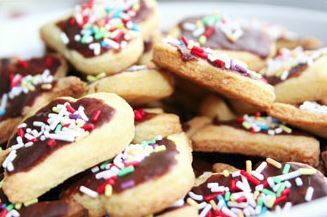 Cookies for a cause! Come to the Holiday Cookie Sale on Saturday, December 8th. This event is sponsored by the Friends of the Library. You can pick up a 2 lb. assortment of homemade holiday-themed cookies for $15 that are beautifully wrapped. The holiday cookie platters are perfect for enjoying at home, holiday parties, hostess gifts, the office and more. The sale starts at 10:00 am on December 8th and continues until sold out. All proceeds go towards supporting the library by providing funding for educational programs, books, media, museum passes and more. 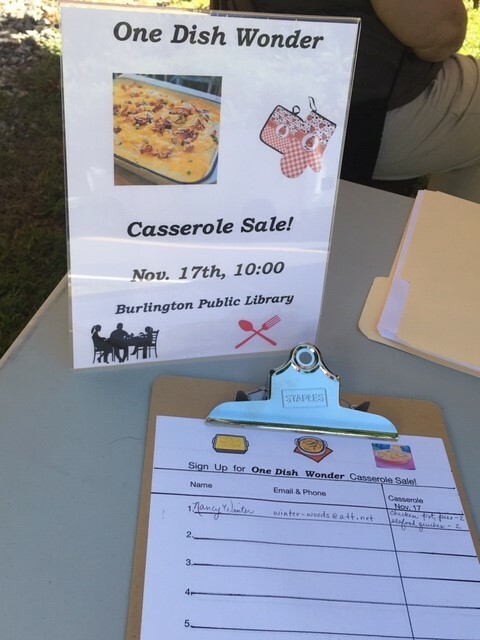 The Burlington Library Association, Friends of the Library, are once again holding a casserole sale on Saturday, November 17th. Our last sale was hugely popular, and we sold out quickly. This year we are hoping to have many more donations of one dish meals. We are looking for volunteers and hope you will help us. Beginning October 11, we will have sign-up sheets in the library and will have available foil pans with plastic covers, as well as details about meal preparation, labeling, and delivery instructions. We are hoping for a wide variety of dishes: stew, chili, pasta based dishes, vegetarian meals, vegetable based dishes, ratatouilles, curried dishes, ragout, shepherd's pie, soups and chowders, quiches, gluten free, etc. We are requesting an email address, if possible, so that we can send you any further information if needed. Please sign up to prepare a casserole or two and encourage your friends to volunteer also. We look forward to a very successful event. 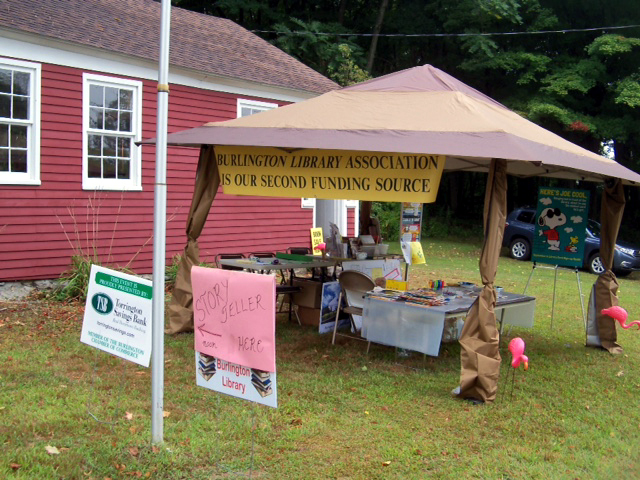 Thank you for your continued support of the Burlington Public Library! Shop for a new favorite read for yourself or gifts for others. 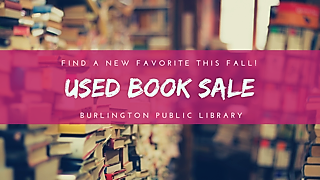 All proceeds from the book sale go towards supporting the Burlington Public Library. There will be a $5 bag sale on the final day (Saturday) from 2:00-4:00. We were surrounded this year by... food trucks, members of the farmers' market, the fire department tent, and a young singer! A lively spot and great foot traffic! The comic mime performer, Robert Rivest, was enjoyed by all ages. The Hornbook Activity coordinated well with the history of the School House and was well prepared by Kaitlin Checovetes. 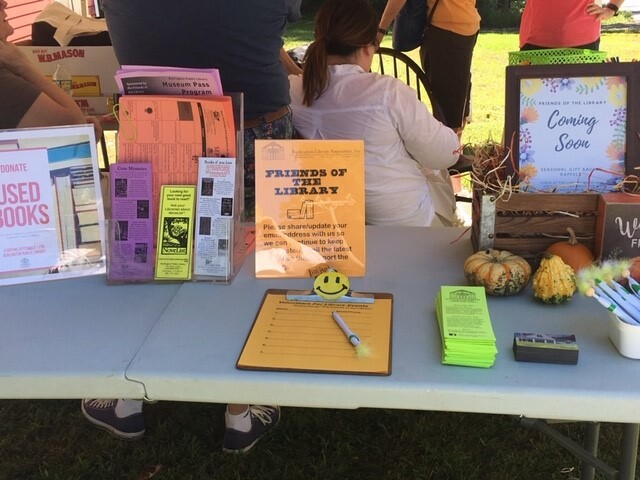 Thank you to all those who stopped by with family and friends and showed interest in the Friends organization and fundraising activities for the library this year. Sue Grant and Sandy Hierl made it possible for us to advertise and have information about the One Dish Wonder Casserole Sale on November 17. 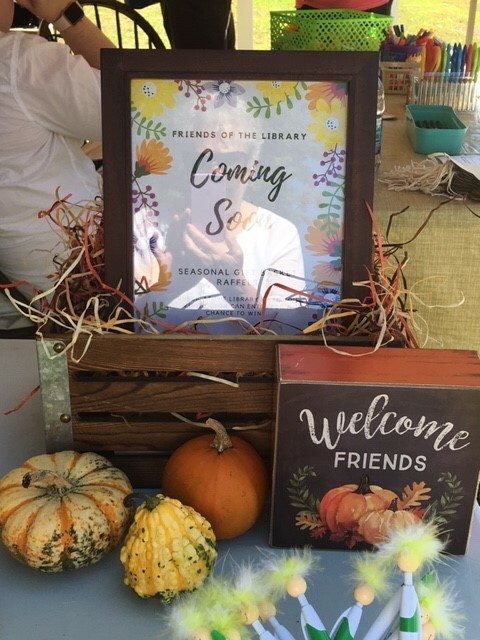 Nancy Monahan and Kristen Williams also were able to prepare a new fund raiser activity...A Seasonal Basket...that will be filled with books and a variety of items related to a theme. Tickets will be available at the Library for everyone to get a chance to own this basket! A big thank you to all our volunteers this year...Kristen Williams, Nancy and Craig Winter, Pat Miller, Rick Labadia, Pat Small, Nancy Monahan, Georgia Riberdy, Jodi Papazian, and Judy Masters. Thank you also to Marie S. Hasskarl for her support all day. Our contribution as the Friends was appreciated by the library and also the community. 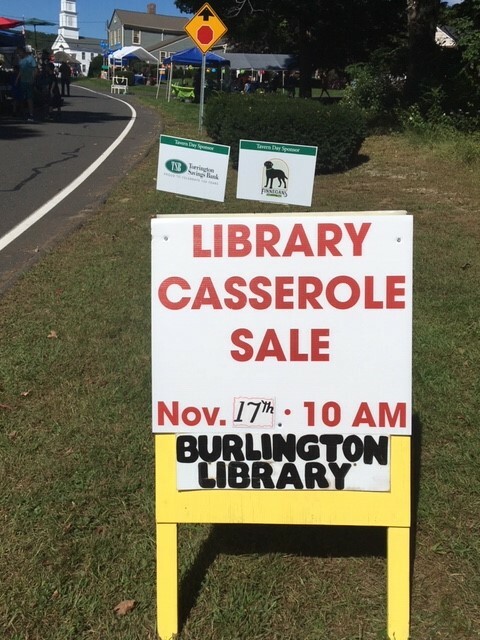 The day was a reinforcement of our mission to support the Burlington Public Library’s services and programs by generating assistance and revenue through volunteer involvement. 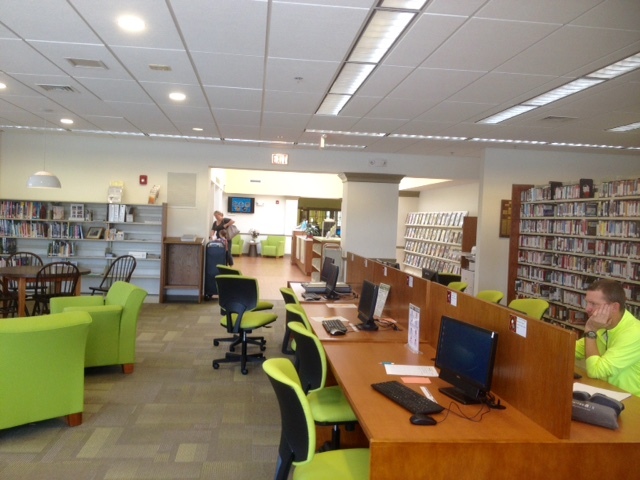 Join us for the Burlington Public Library's Grand Reopening! There will be a ribbon cutting. Catered refreshments will be served. Click here to sign up. Join us at the Little Red Schoolhouse on Tavern Day on Sunday, September 17, 2017 from 11:00 to 4:00! 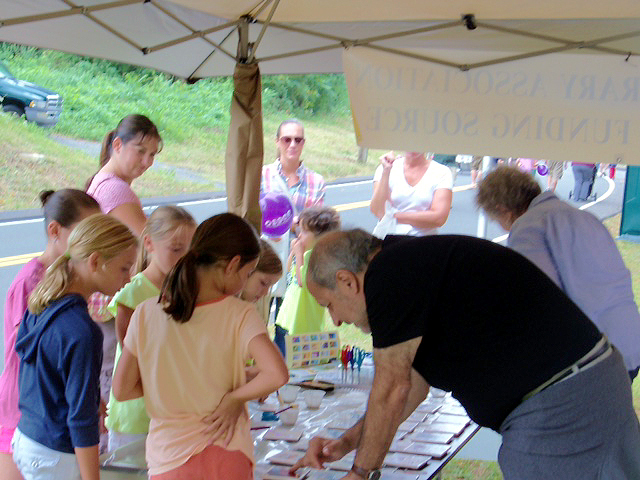 Stop by to make a creative, personalized tile and listen to an amazing Storyteller. 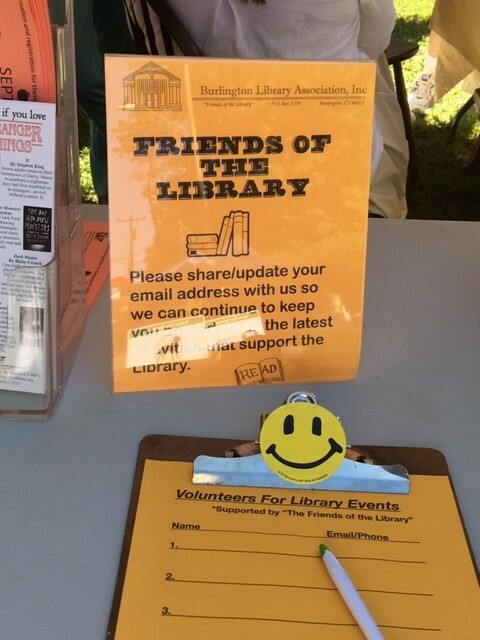 Friends of the Library will have newsletters and bookmarks to share, and let everyone know about upcoming events that we sponsor. We tried something new this year! Instead of the pie sale, we had a casserole sale. The first "One Dish Wonder " fundraiser was a success! The sale was held starting at 10am on Saturday, November 5. 2016, and was a sell-out by 1pm! 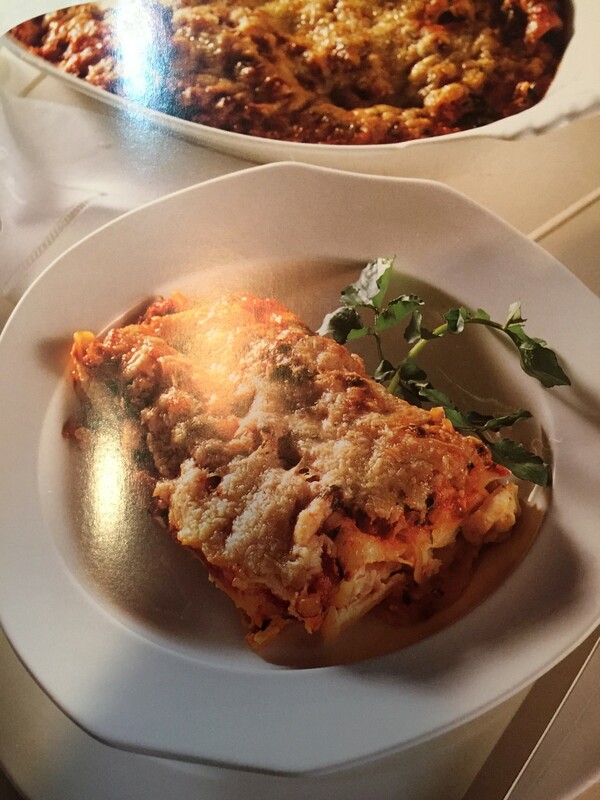 We grossed $690 by selling 46 casseroles, prepared by 26 people. After expenses of $57.64, our net proceeds for the Library were $632.36. 9/18/16, 11-4. at the Little Red Schoolhouse on Tavern Day! Tavern Day at the Schoolhouse was wonderful... weather included! The Storyteller and Magician performances were enjoyed and well attended. A few books were also sold and many people enjoyed looking at the past graduation pictures, some finding themselves or relatives, from the Burlington Room. The word- tile activity was very popular. We had people from 2 to 82 participating in the craft... at least 70 magnets were created! 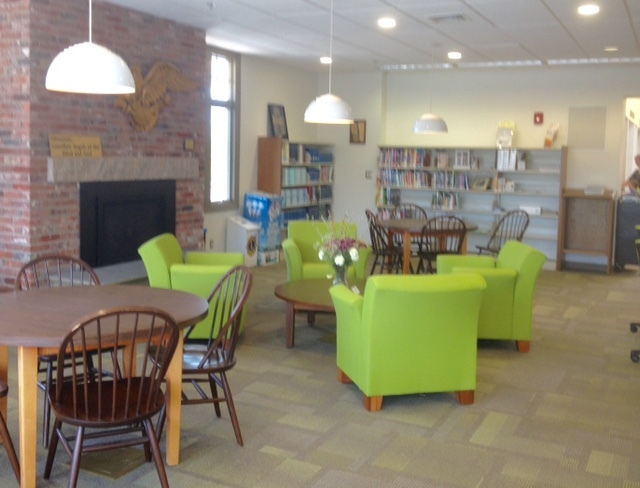 Thank you Diana Rudzinski and Sara LoPresti of the Library Staff for such a wonderful project! Thanks to all our volunteers and those who stopped by with family and friends for helping to make the event so successful! The day could not have been accomplished without volunteers Pat Miller, Kristen Williams, Georgia Riberdy, Nancy Monahan, Sandy Hierl, Ed Krewalk, Sandy Mazeau and Rick Labadia. 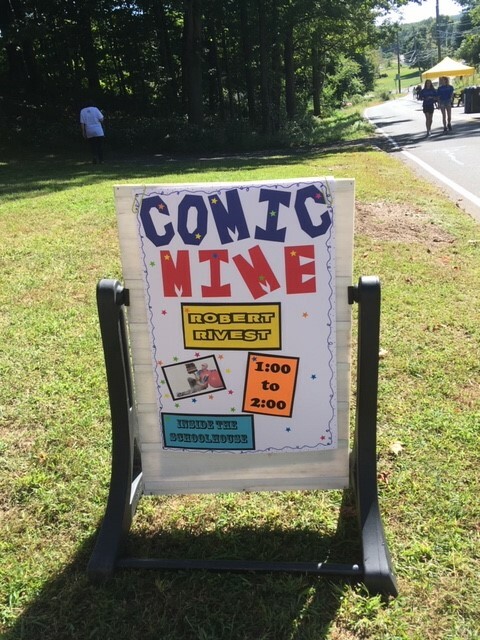 Thank you also to Marie Spratlin Hasskarl for her support all day and to Craig Winter [and his truck] for his help with set up and take down of our sign, the tent and tables. Our support as the Friends was appreciated by the library and also the community. 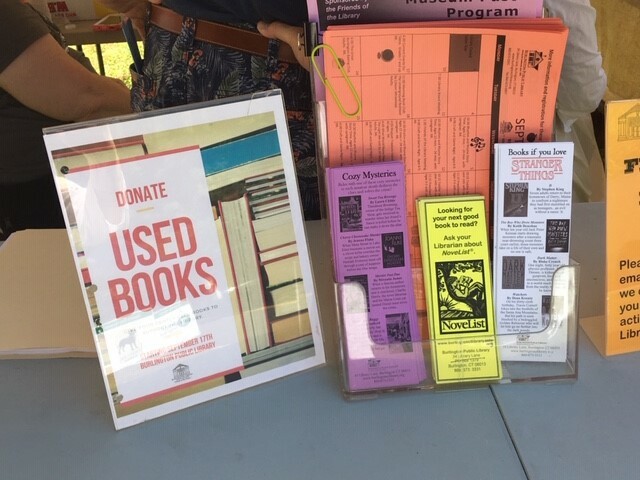 The day was a reinforcement of our mission to support the Burlington Public Library's services and programs by generating assistance and revenue through volunteer involvement. 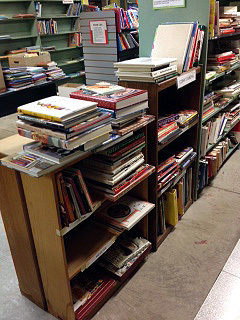 BOOK SALE - Holiday "Like-new" book sale, Dec. 5, 10-4. November 21, 2015, 10am until sold out. Annual Blue Ribbon Pie Sale. Day of Sale: Last Minute Drop Off 9am; Pies Go On Sale at 10am sharp! Sale raised $1140. Congratulations and thanks to Nancy Winter and her team. Debbie of Country Quilt Llama Farm will come to our library with a live llama! She will first let the children pet the llama, and then she will read the story Is Your Mama a Llama? Questions and answers will follow the presentation. BAG SALES: Last Saturdays of Sept., Oct.) 10 to 1. Burlington Public Library, lower level, weather permitting. Fill our bags for $5 each* with all genres of fiction, nonfiction and children's books. Bring your own bag to carry your purchases afterwards if desired. Also, a section of free books is stocked with older titles. Newer donations are held until April sale. *NEW PRICES: 2 bags for $10 and get third one free! Tavern Day on Sunday, September 13, 2015 was fun as usual. The downpour which hit the last fifteen minutes was expected but disappointing. People enjoyed the Little Red School House, the crafts, the storyteller and the magician. We actually sold $13 worth of older 1900-1960 books. Thanks to all the volunteers: the day could not have been accomplished without Marie Spratlin Hasskarl, Craig and Nancy Winter, Anne Walluk, Pat Small, Liane Walker, Mary Ann and Rick Labadia (pictured below), and Len Berton. Kevin Mullen and Maeve came to say hello! BAG SALE: May 30th. 10 to 1. Burlington Public Library, lower level. Fill our bags for $5 each with all genres of fiction, nonfiction and children's books. Bring your own bag to carry your purchases afterwards if desired. Also, a section of free books is stocked with older titles. ANNUAL MEETING, Friday, May 15th. 6:30 pm Social, 7:15 pm Business Meeting. Light refreshments. All members cordially invited. ANNUAL APRIL BOOK SALE. Thursday, April 23, 2015, 2 to 7 pm : $5.00 entrance fee to get first pick of newest donations; Friday, April 24, 10 am to 4 pm : free admission, sale continues; Saturday, April 25, 10 am to 4 pm. : $5 bag sale of remaining collection. Lower level of Burlington Public Library. Proceeds of this sale were $1123.50. USED BOOKS AVAILABLE IN THE WINTER! BAG SALES: Last Saturdays of January, February and March 2015. 10 to 1. Burlington Public Library, lower level, weather permitting. Fill our bags for $5 each with all genres of fiction, nonfiction and children's books. Bring your own bag to carry your purchases afterwards if desired. Also, a section of free books is stocked with older titles. Newer donations are held until April sale. The January 31st sale raised $458, the February 28th sale took in $424, and the March 28 sale did $430! Thanks to all the shoppers and volunteers. Friends of Connecticut Libraries select our own Sandy Mazeau for their 2009 Lifetime Achievement Award. Purchased 26 new LeapPad special electronic "books"
Sponsored Science Isn't Always Pretty with Keith Michael Johnson Click for pictures.